Thor’s Well is a collapsed sea cave off the coast of Oregon in the Pacific Ocean. The geographical oddity is a favorite among tourists and photographers due to the optical illusion it creates, whereby the ocean looks as if it is draining into a bottomless hole. 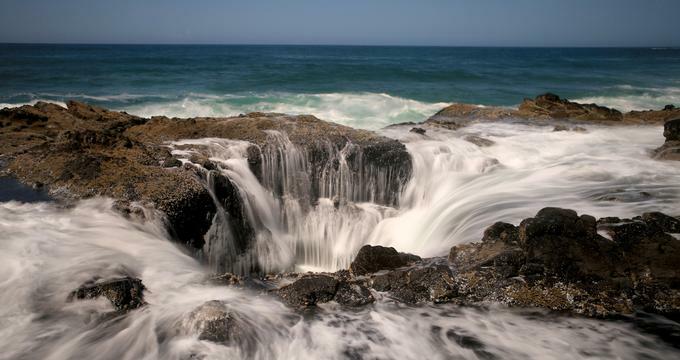 Optical illusions aside, the “drain” of Thor’s Well is in fact just 20 feet deep. The well is located approximately 3 miles south of the town of Yachats in the Cape Perpetua Scenic Area. Cape Perpetua is a forested headland on the Pacific coast, part of the Siuslaw National Forest. These forested cliffs overlook the rocky basalt coastline. During high tide, waves roll in from the underside of the bowl-shaped geographical feature, causing the water to spurt forcefully from the top. As the water rolls back into the well, the ocean appears to be draining. This cycle continues as the Thor’s Well fills and drains with each wave. At low tide, while the rocks are mostly uncovered by the ocean, visitors can see how the optical illusion works. Although Thor’s Well is no more dangerous than the ocean around it, visitors are urged to be cautious when viewing. The volcanic rock is sharp and slippery, and tourists have been caught off guard and toppled by rogue waves at high tide. Nonetheless, it is a popular spot for viewing, especially by amateur and professional photographers. History: The well most likely began as a sea cave, which is a cave formed by the force of the ocean and its gradual erosion of the rock. At some point, the ceiling of the sea cave collapsed in, creating the appearance of a hole in the ocean. The ocean surges and sprays from the openings at the top and bottom of the collapsed cave, creating the dramatic appearance of draining or spouting. Over the years, Thor’s Well has earned the dramatic nicknames of “Gate to Hell” or “Drainpipe of the Ocean,” but visitors at low tide can clearly see there is no such bottomless drain. The Cape Perpetua area has been home to the Native Americans for close to 6,000 years. The Alsea peoples hunted in this area for mussels, clams, sea urchins, and crabs. Today, one can see evidence of their presence in the large amounts of discarded mussel shells surrounding the Cape Perpetua Visitor Center. In the Alsea native language, the area was named “Exposed Place.” The site was named Perpetua by Captain James Cook on St. Perpetua Day in 1778, when he arrived searching for a Pacific entrance to the Northwest Passage. Over 200 years later in 1908, it became part of the Siuslaw National Forest. The Siuslaw National Forest covers over 630,000 acres from the Oregon coast to the Oregon Coast Range. Visitors to the National Forest may camp, fish, or enjoy the trails for hiking, horseback riding, mountain biking, or off-road recreational vehicle use. Ongoing Programs and Education: For the best viewing of Thor’s Well, visitors should time their visit to arrive at high tide. Limited parking is available at the Cook’s Chasm pull-out off Highway 101 in the Siuslaw National Forest, less than half a mile south of the Cape Perpetua Visitor Center. The visitor center at Cape Perpetua has an ocean viewing deck and offers extensive exhibits on the culture and natural history of the area, interactive exhibits for children, a theater, and a bookstore. Hikes that begin at the visitor center lead to tide pools along the coastline or views from the cliffs overlooking the ocean. During the months of December and March the area is popular for the viewing of migrating whales. What’s Nearby: Adjacent to Thor’s Well are additional oddly shaped features of the volcanic basalt rock. Cook’s Chasm creates a Sprouting Horn of water driven by the power of the ocean tide, and Devil’s Churn is a long crack in the rocky coastline within which outgoing and incoming waves collide and explode upwards. Two miles north is the town of Yachats, Oregon. In 2007, Yachats was named among the 10 Coolest Small Towns in the US by Budget Travel Magazine. In 2011, the founder of the Frommer’s Travel Guides cited it as number 7 of his 10 favorite travel destinations in the world. The area has been occupied for at least 1,500 years by the Alsea tribe and is rich in history.